Back in November I wrote about my thoughts regarding TAG Heuer and how with the delayed/cancelled CH80 movement and the lower average selling price I felt there was a lot of potential that TAG Heuer was missing out on. A brand with over 150 years of watchmaking heritage, TAG Heuer has a huge history to look back which I feel sometimes gets ignored in favour of being an entry level affordable Swiss watch. However heritage and history are the two things that TAG Heuer have decided to focus upon with these pre-Baselworld releases; Two vintage inspired pieces that stay true to the rich history of the brand, the Carrera Calibre 6 Chronometer and the Carrera Calibre 18 Telemeter. Now the history of the Carrera, like the Speedmaster or the Daytona, is something that most watch fans are familiar with so I'll keep this relatively brief. The Carrera family of watches has been in production at TAG Heuer since 1964 when Jack Heuer wanted to design an easy to read, shock resistant and waterproof wrist watch that motor racing drivers could use. 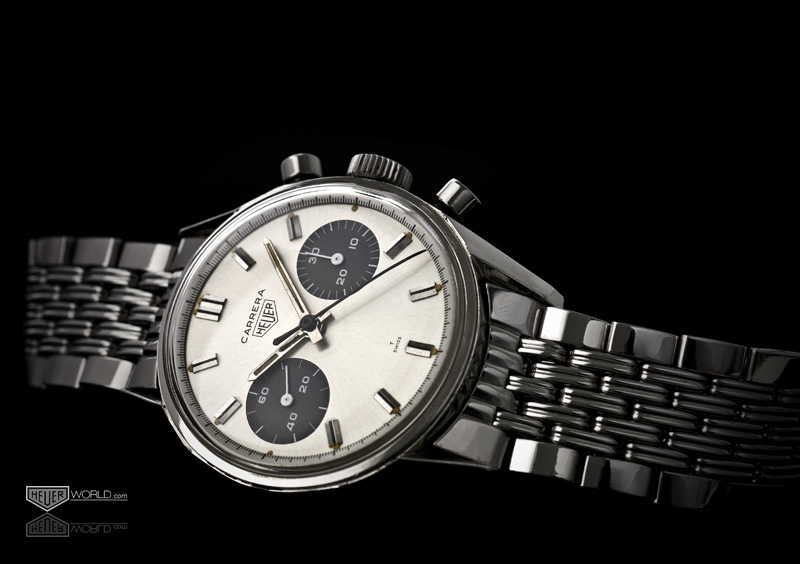 He created what would be one of the best sports chronograph wristwatch out there, the Heuer Carrera. An avid motor racing fan, Jack Heuer named the Carrera after the legendary Mexican road race, La Carrera Panamericana, which from 1950 to 1954 was a three thousand miles six day event that ran from North to South in Mexico. The Mexican Government wanted a way to increase commerce and tourism in the country by promoting Mexico’s newly finished highways and decided that the best way to do so was a death defying race with sports cars racing at ludicrous speeds across the countryside . The race was renowned for being incredibly dangerous with twenty seven people dying during the five years and with the incredibly long unsupervised sections of track, it was common for accidents to go unnoticed for several hours. Part of the official rules of the race was that a driver would be disqualified if he stopped to help in an accident as this would increase the risk of them getting hurt by a trailing car. The Mexican Government decided to stop the race in 1955 as a reaction to the Le Mans race disaster. Described by TAG Heuer as a “coloured tribute to the original 1963 Carrera Design”, this watch has a sunray effect silver dial surrounded by a blue inner bezel with HEUER printed in bright red in the middle of the watch. Both of these pieces have chosen to use the traditional Heuer logo showing a commitment to their heritage and the inspiration for these watches. Something that I didn’t like about last years Drive Timer piece was the use of the TAG Heuer logo and it’s good to see a change made for the better. Where the original Carrera’s would have had a matt finished sub dial, the sub dial on these watches is azurage finished adding a contemporary look. Visually it is very similar to the 2013 Jack Heuer Limited Edition piece but without the chronograph feature. Powered by a Calibre 6 movement, this is one of the few TAG Heuer pieces that are COSC certified with only the Calibre 17 Jack Heuer and Calibre 8 GMT Carrera’s being the other two ranges still produced that are certified. For those that are unaware, the Controle Officiel Suisses des Chronometres (COSC) is an independent Swiss company which test the accuracy of watch movements over a set number of days in five positions and three different temperatures. To be qualified as a chronometer the watch cannot lose more than four seconds and gain no more than six seconds a day. As to why there are so few COSC TAG Heuers, I believe the answer does come down to cost as getting a watch certified will increase the price and with TAG generally wanting to keep their prices affordable it does make sense that it is only in the more expensive Carrera range. Whilst it’s not exactly historically accurate , I do like this heritage styled Carrera without a Chronograph feature as it keeps the price down making this more affordable as it is currently priced at $3500 USD. Unlike the Calibre 18 which features a sapphire crystal caseback, this piece will have a solid stainless steel back with the vintage Heuer logo engraved in red. I would not be surprised if either of these pieces are either limited to boutiques or shop-in-shop’s only similar to the Drive Timer but fingers crossed that they are able to get a more widespread release. Now if the previous watch was a modern tribute piece in regards to a vintage Carrera this is much more true to form. Exceptionally similar in style to the original Carrera Reference 7753, this “panda-dialed” black and silver dialed Chronograph sized at 39mm is just beautiful and I can’t wait to see it on the wrist. Something that TAG Heuer has changed is rather than a traditional tachymeter which is used to measure speed, this watch has a telemeter ring around the inner bezel which is used to measure distance. By starting the chronograph when you see something (a flash of lightning) or hear something (artillery fire, as was the original use of a telemeter) and stopping it when the event ends ( thunderclap or a loud explosion) you can read off the dial and see the distance. This watch has “kilometer” printed at 12 o’clock and I wonder whether there will be a “miles” equivelant for various regions similar to the metric/imperial versions of the Oris depth-gauge. Maintaining it’s heritage credibility, this piece is a two dialed chronograph with the running seconds on the 3 o'clock subdial and a minutes counter at 9 o'clock. Some watch fans might find the lack of an hour register frustrating but in reality there will be very few people needing to use this chronograph to time anything, especially for over an hour. The two sub dials makes the dial nice and symmetrical and of course makes it more similar to the 7753. As I said regarding the Speedmaster Skywalker X-33 announcement, the days of mechanical chronographs serving a “functional purpose” is gone with modern digital technology being far superior but a classic design like this is always going to be gorgeous. TAG Heuer have said that this piece have a glassbox style crystal resulting in a slimmer case design. A glassbox is still sapphire crystal but rather than sitting flush with the case it will sit slightly raised like traditional hesalite crystal giving this piece a more vintage look. TAG have yet to release any photographs of the side profile of this watch but I would not be surprised if it was similar to style to the Longines Heritage 1973, another glassbox heritage chronograph. I'm a big fan of these two pieces and I look forward to seeing what other pieces TAG Heuer are bringing to Basel this year. For more vintage Heuer Carreras and other pieces please visit www.heuerworld.com. What would I do if I suddenly became CEO of TAG Heuer? Cut down most of the references and reduce focus on in-house movements. And that's just to start with. Last week the world saw the prototype for the new TAG Heuer Autavia Heuer-03. Caliber 11 spoke with the man behind the curtain, Jean-Claude Biver, about it. I thought it would be fun to try and fact check what he said. 1973, Great Britain. The island nation had just joined the precursor to the European Union, a Royal Wedding had just taken place and an author for the Illustrated London News wrote about quartz watch. Let's see what he thought!